Published: Sept. 18, 2014 at 01:50 p.m. Updated: Sept. 19, 2014 at 11:23 a.m. The Denver Broncos were embarrassed in Super Bowl XLVIII, so there aren't many folks giving them a chance to win in Seattle this week. But the Broncos have a strong argument to reconsider their chances: They aren't remotely the same team they were on that unseasonably warm New Jersey night in February. Only three defensive starters (Sylvester Williams, Terrance Knighton and Nate Irving) from the Super Bowl remain, and Irving is playing another position. The offense is more stable, but the unit has three different starters (Montee Ball, Emmanuel Sanders and Ryan Clady), and two of its offensive linemen are changing positions. 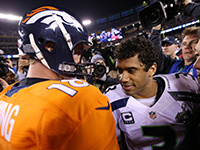 The Broncos travel to Seattle on Sunday in a rematch of Super Bowl XLVIII. Here's a look back of some of the most memorable Super Bowl rematches in NFL history. Add it all up, and less than half of the Broncos' starting lineup from Super Bowl Sunday will be starting in Seattle at the same position. The team has key players back from injury like Clady, linebacker Von Miller, safety Rahim Moore and cornerback Chris Harris. The secondary was rebuilt with free-agent pickups Aqib Talib and safety T.J. Ward. DeMarcus Ware has added juice to the pass rush, and defensive end Derek Wolfe is now a starter. It's too early to draw big conclusions about this rebuilt Broncos squad, but the offense has looked as good as ever. The Broncos get Wes Welker back in the lineup this week, Julius Thomas is only getting better and Emmanuel Sanders has ably replaced Eric Decker. The defense hasn't been dominant yet, but it closed out games against the Colts and Chiefs. First-round pick Bradley Roby stopped Reggie Wayne twice on the Colts' final drive, and Ware nearly ended Denver's second victory with a sack-fumble that was overturned. Super Bowl winners are 3-2 in regular-season rematches the season following a championship. The Seahawks are certainly the favorites here, but a Broncos victory would not be that stunning because this is a totally different -- and more balanced -- Denver team.